Before doing a heavy lift, you have to warm up with a lower weight to make your muscles warm and ready. For example if you will squat 100kg for 5 reps, you should first squat 20kg then 60kg for 5-10 reps. A 5-10 minute jog immediately before your gym session can also be useful for increasing your muscle temperature. Squats train your entire lower body and torso. It is a great exercise for increasing strength, and having greater strength gives you the base you need to develop great power (for running, jumping and so on). Starting Strength is a great book for making sure your technique is good and safe. 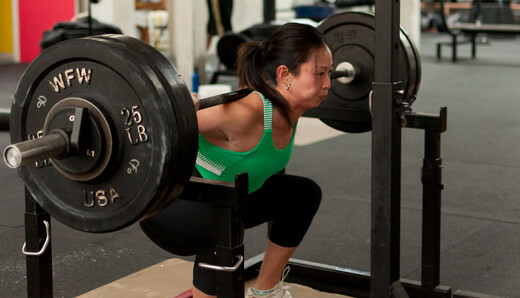 Power cleans use similar muscles to the squat and deadlift, but in a far more power oriented fashion. Power cleans encourage your body to utilize your strength more quickly. The power clean has a very strong correlation with vertical jump, even more so than squats, so you know that it is useful. Consider how fast you have to accelerate the weight for it to move all the way from the ground to your shoulders and you can understand how much power the exercise requires. 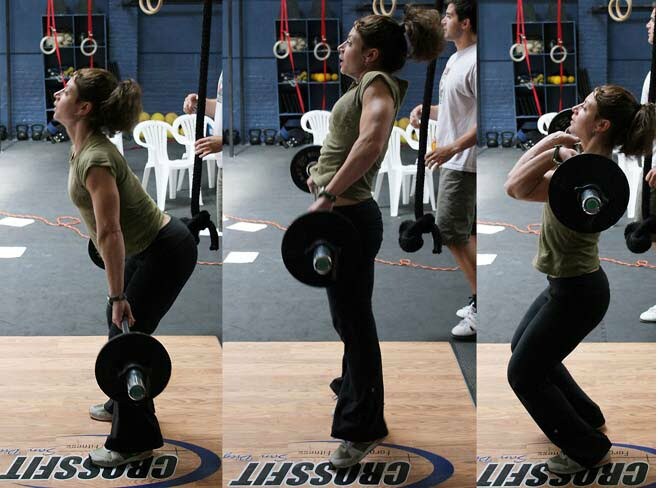 You will most likely be lifting more than the woman pictured and her feet should have been wider in the last frame, the picture is there only as an example. Technique of this lift is also discussed in Starting Strength. Deadlifts are a great strength exercise, especially for your legs and torso (back in particular). Along with squats, the deadlift is a great way to give you the strength you need to power clean heavier weights. Again, technique for this exercise is described in Starting Strength. 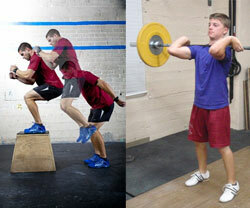 To warm up for plyometrics, you should do similar movements to those you will be training, but at 50-70% intensity. This will help you to avoid injuries that you could sustain from doing high-intensity plyometrics while cold. A good warm-up could consist of the following exercises for a total of 10 minutes. The drop jump requires you to jump immediately after touching the ground. The increased elastic energy stored in your hamstrings and glutes from the downward acceleration overloads your muscles then you power upwards. Research suggests that you should be able to squat 1.5x your body weight before incorporating box jumps into your routine, and young children should not do it at all because their bones are not fully developed strength-wise. 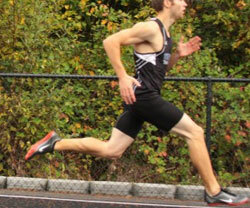 Hurdle hops train your body in a similar fashion to the drop jump, but anybody can do this exercise. As soon as you land, you should immediately explode as high as possible over the next hurdle. 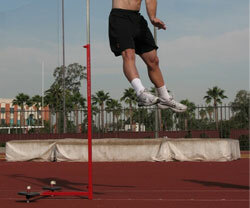 If you take it easy and just bounce over the hurdles you will be reducing the benefit of the training. 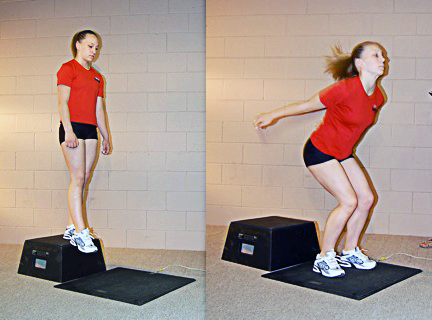 While box jumps are a similar movement to hurdle hops, it forces you to jump a certain high for each rep and you can easily measure your progress in height. You can add resistance by holding dumbbells with straight arms. Sport specific speed and agility drills. Including rest periods, it should take you around 45 minutes to finish. This program has the potential to add half an inch per week to your vertical jump. That is about the rate that similar programs have achieved when studied by scientific journals. This number can vary depending on your training level though. No Responses to "Exercises to Increase Vertical Jump"